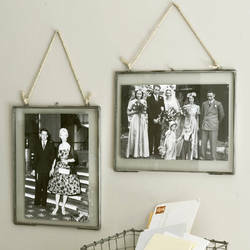 Beautiful Photo Frame, made up of Brass and glass. ART INDIA COLLECTIONS is a reputed in international market for manufacturing & Exporting Glass Boxes, Lanterns, Candle holders and many more products. With our years of experience & in-depth knowledge in this field, we are engaged in offering a quality-assured array of Wall Hanging Photo Frame. Our organization is well-known as a prominent manufacturer, supplier and exporter of Hanging Photo Frame. These are creatively designed by a team of personnel, keeping the latest market trends in the mind.. Clients can avail these beautiful frames from us in a wide variety of designs, patterns, sizes, shapes and color shades. As a reputed organization, we are indulged in offering Hanging Photo Frame. We provide facility of customize of this frame like three photo slots or more. This frame capture the most loving moments of life and promises to keep safe memories as fresh as ever. Available in market at competitive rates. 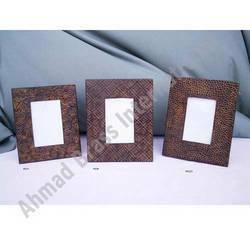 Offered by us is a wide range of attractive Batik Frames to the esteemed customers. These products are hand made. Moreover, we make available these products to the clients in various shapes, sizes, designs and color combinations. We are offering Hanging Photo Frame to our clients. We bring forth vast industrial experience and expertise in this business, involved in offering a high-quality range of Wooden Hanging Frame. Keeping in mind the current market standards, we are offering exclusive range of Customized Wall Hanging Photo Frame that is used for gifting purpose. Our Frame Wall Hangers are manufactured using quality stainless steel, annealed raw material, and micro porous chrome. Thus, the product is high on strength and offers optimum resistance to corrosion. The provision of hooks and holders facilitates the easy hanging of items like kitchenware easy.